A talented young ballerina from South Lakeland received funding to follow her dreams and attend a prestigious London ballet school. 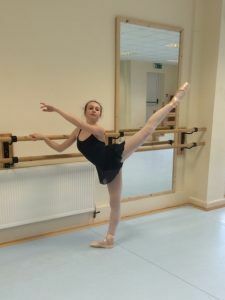 17 year old Jordan Crewes has received nearly £4,000 from three separate funds to help fulfil her ambition of becoming a professional ballet dancer. She was most recently awarded £2,000 from the Cumbria Young People’s Fund and Edmond Castle Educational Trust, to enrol on the final stage of the Royal Ballet Associate programme. Jordan was crowned Cumbria under 14 ballet champion in 2012 and 2013. She studied at the Hammond Dance and Drama School in Chester for two years until she was scouted for the Moorland International Ballet Elite in Clitheroe. While studying here, Jordan was offered a place on the Royal Ballet Associate scheme at senior level. She attended classes at Birmingham Royal Ballet, where she continued to progress as a ballet professional. This opportunity led to Jordan being offered only one of four available places in the UK for the final stage of the Royal Ballet Associate programme, the Advanced Associates. Jordan will attend classes at the Royal Ballet Upper School in Covent Garden for the next two years, as well as continuing her full time ballet studies. Jordan would then like to audition for a place in the Royal Ballet Company.